It’s easy to get a dining party off to a rousing start at Fuzio Bar & Ristorante. 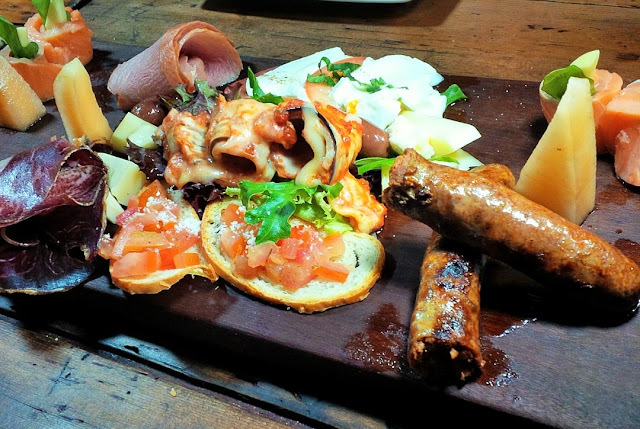 Just order the house Antipasti (RM88 for 2 persons, RM148 for 4) and watch jaws dropped when your companions spy the plethora of cold cuts and appetisers. Pin-drop silence will ensue as you savour delicate slices of paper-thin cecina ham (Spanish salt-cured air-dried beef), smoked duck breast and salmon carpaccio. Then proceed to sample lamb salsiccia (Italian link sausages) accompanied by tomato caprese salad, eggplant involtini (rolled eggplant slices with melted cheese and marinara sauce) and tomato bruschetta. Little wedges of melon paired with gorgonzola, tallegio and grana padano cheeses are perfect when enjoyed with a glass of your fave tipple or house cocktails like Fuzio Killer (RM34) – a heady, icy-cool blend of fresh mint leaves with rum, vodka, triple sec & limoncello. Waiting time is hardly noticeable when you chomp on tasty Deep Fried Calamari (RM24). Fuzio does an excellent version with the squid rings sheathed in ethereally light, crisp batter. Rustic porcini risotto lend substance and deep-seated aroma to the signature dish of Spring Chicken Risotto (RM72). Well-marinated and cooked till fork-tender, the poultry leaves a pleasing impression long after the bones are picked clean. Pasta is central to Italian dining so you can’t go wrong with a classic staple like Spaghetti alla Carbonara (RM38). The pasta is cooked perfectly al dente, slathered in a creamy reduction embellished with smoked duck breast & mushroom. The other bankable choice is Funghi Pizza (RM32), a thin crust crunchy pizza adorned with loads of earthy button mushroom; the fungi’s musky scent amplified by the drizzle of truffle oil on top. Red meat eaters would find delectable succour in Creamagliera di Agnello (RM76) - grilled lamb rack with goat cheese and rocket salad and Filetto di Manzo alla Griglia (RM78) - grilled Angus tenderloin with mushroom cartoccio (baked in paper parcel). Both dishes are deftly prepared with the required doneness - pink for the lamb and medium rare for the beef. The chefs deserve applause for achieving this tricky part. White fish to hit the spot here is Merluzzo Al Forno (RM68) – flaky, moist baked cod crowned with slightly charred leek threads and placed atop a bed of pesto mashed potato. Have tummy room to spare? Then dive into luscious treats such as Chocolate Flan with Gelato (RM28), Panna Cotta with Mix Berries Sauce (RM24) or Tiramisu (RM28). If you prefer a caffeine kick, the Affogato (RM18) should do the trick of injecting a jolt of jave into your system. FUZIO is open Mon-Sat from 12pm-3pm, 5pm-1130pm. For reservations, call tel: 03-2110 0303. Address: 29, Jalan Berangan, KL. Pasta and cheese are inseparable in Italian cuisine. Expect abundance of both when you dine at Olive Garden, the largest casual Italian dining chain out of the USA. While you peruse the menu, enjoy a glass of Frozen Strawberry Margarita (RM31) from the bar. In keeping with its tradition of warm, welcoming and satisfying Italian-inspired dining, diners are treated to unlimited servings of oven-fresh breadsticks and soup or House Salad (available a la carte at RM15.50) with any entrée ordered. Freshly grated cheese is added at tableside to lend the salad extra ‘oomph’. Big on cheese? Then you’d swoon over cheese-laden dishes such as Smoked Mozzarella Fonduta (RM29.90) – Italian fondue of smoked mozzarella, provolone, parmesan and romano cheeses baked and served with breadstick crostini, and Triple Cheese Carbonara Piadina (RM18.90) – flatbread pizza smothered with melted mozzarella, parmesan and Grana Padano alongside cherry tomatoes. The game opener to bank on here is Sampler Italiano (RM59.90) – a sampling plate of three antipasti: classic or spicy deep-fried, lightly breaded Calamari (available in solo serving RM18.90 or sharing portion RM29.90), Lasagna Fritta (solo RM15.90 or sharing RM39.90) and Shrimp Scampi Fritta (solo RM16.90, sharing RM36.90) in some garlicky butter sauce. Out of the trio, our vote goes to the uncommon yet tasty fried parmesan-breaded lasagna topped with parmesan cheese and marinara sauce. White broad beans, ground beef, fresh tomatoes and tubetti pasta in a savoury broth stir up loads of hearty flavour in Pasta e Fagioli (RM11.80) while fresh vegetables, beans and pasta in a light tomato broth forms the foundation for Minestrone (RM11.80). If you prefer creamy soups, we recommend opting for Chicken & Gnocchi (RM11.80) – a lush broth made with roasted chicken, traditional Italian dumplings and spinach. You can even treat yourself to an indulgent Lobster Fettuccine (RM53.90) - a superbly rich pasta dish complete with lobster tail and shrimps in lobster seafood cream sauce. Two lightly fried parmesan-breaded chicken breasts smothered with Olive Garden’s homemade marinara sauce and melted Italian cheeses in the Chicken Parmigiana (RM26.90) are perfectly suited for hearty appetites. Prepared fresh daily with layers of pasta, parmesan, mozzarella and meat sauce from a mixture of seared beef and Italian sausage, is it any wonder Olive Garden’s big flavoured classics like Lasagna Primavera with Grilled Chicken (RM38.90) has enduring appeal. For those who want it all, embark on a Tour of Italy (RM59.90) – a sizeable serving of Chicken Parmigiana, Lasagna and Fettuccine Alfredo that should satisfy pasta gluttons. A treasure trove of seafood abounds in Pasta Pescatore (RM41.90). Most local diners would enjoy this sublime dish as apart from its wickedly lush red pepper seafood sauce, succulent shrimps bay scallops and mussels are buried in the pasta. Otherwise, you can always count on Salmon Risotto (RM45.90) to deliver the carbo allocation. It’s best suited to those who like thick, viscous textures. Tomato-basil pesto helps to alleviate the cloying aftertaste. Carnivores can ‘meat’ up with Steak Toscana (RM79.90) and Center Cut Filet Mignon (RM79.90) – two notable options to satisfy their red-blooded cravings. The first features a marbled ribeye cut while the latter comprises a juicy, tender prime cut with grilled vegetables. Dessert is as safe as they come with popular choices like Black Tie Mousse Cake (RM12.80) and Tiramisu (RM12.80) ruling the roost. In response to market demand for lighter, less guilty sweet treats, small shooter glasses of Piccoli Dolci are available. Take your pick from Almond Tiramisu, Chocolate Mousse, Lemon Mousse, Dark Chocolate Caramel Cream or Strawberry & White Chocolate (RM6.80 for 1, RM18 for 3 or RM29 for 5) for that proverbial sweet ending to your visit.